There are a lot of options when it comes to sharing photos with friends. Where ‘friends’ are those people just around the corner you see every day at the coffee house to those somewhere else that you will never actually converse with in person. When it comes to photo sharing, it’s the talent of friends that caused the relationship to form. Generally, it’s a person’s style of photography, or maybe the subject. EyeEm has been a popular solution to share photos with the iPhone, where keywords help describe and group the photos for others to find. The actual enhancing filters is enough to add a bit of personality to a photo, but generally photos found on EyeEm are posted as they are taken. By having EyeEm on the iPad now, fine detail editing in another app then uploading for others to enjoy is a easier task than doing on the pocket sized screen of the iPhone. Photos posts on EyeEm are less about the descriptive text users add, and more about ‘tags’. The maximum tags a photo can have is four so this helps avoid photos being posted to many groups and flooding the groups. With EyeEm, a view of ‘friends’ posts is available, but most often we find ourselves cycling through the groups and choosing one to look through. Each group is a Tag, with a few of the photos in that area showing to tease us into clicking through and getting lost in posts from people of like interest. 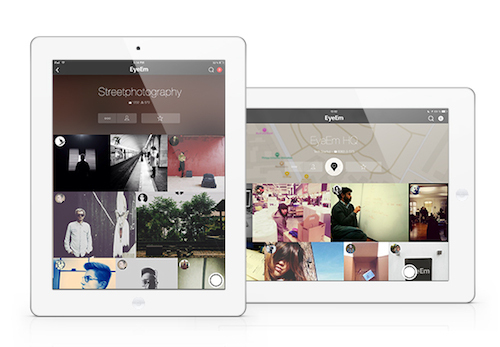 Perhaps, EyeEm is about photos in an area of interest and less about narrowing down to one person’s snaps.